In advance: prepare the basmati rice and place in rice cooker with timer set for dinner time. Heat the oil and butter in a skillet over medium-high heat. Add the onion and cook until soft – about 5 minutes – stirring occasionally. Add the garlic, salt, pepper, and coriander and stir to combine. Add the rice and cook for 4 – 6 minutes, stirring constantly. Turn off the heat and add stock. Stir to combine, then scrape the entire mixture into a rice cooker. Close the lid and set the timer. 60 minutes before you want to eat (or more or less depending on your knife skills) – prepare all of the ingredients for the pumpkin, meat sauce, and yogurt sauce. When you peel the pumpkin, you will likely lose some of the flesh in the process. Don’t worry about this – it’s unavoidable. 40 minutes before you want to eat – preheat the oven to 350. Heat some canola oil in a skillet over medium high. When it is hot, add the pumpkin pieces to brown lightly. Turn frequently and brown all sides. Remove pan from heat and transfer pumpkin pieces to a roasting pan. Mix cinnamon and sugar and sprinkle over the pumpkin pieces. Cover with foil and place in the oven for 30 minutes or until tender. 30 minutes before you want to eat – In the same skillet you used to cook the pumpkin, add some more oil. (Unless there are burnt pieces of pumpkin – and there shouldn’t be – don’t worry about cleaning the pan before this step.) Turn heat back to medium high. Add the onions and cook until lightly browned – 5 minutes or so. Add the coriander, salt, pepper, and garlic and stir to mix. Add ground lamb or beef and cook until browned – 8 – 10 minutes – stirring occasionally. Add the tomato sauce and water and bring to a boil. Lower heat to a simmer and simmer until ready to serve. 10 minutes before you want to eat – make the yogurt sauce. In a mixing bowl, add the minced garlic and salt. Use a fork to mash into a paste. Add the yogurt and dried mint and stir to combine. Taste and add more salt if necessary. 5 minutes before you want to eat – remove the pumpkin from the oven. To serve, place several pieces of pumpkin on a plate. Top with the yogurt sauce then the meat sauce. Serve rice on the side. You cannot believe how delicious this dish is. Leave off the meat and you have a vegetarian favorite as well. If you’re ever in San Carlos, CA, visit this restaurant. It is fabulous! This was so, so tasty. We made it with lamb. My mouth is still watering. I do feel, however, that the pumpkin is lacking something and I can’t pinpoint what it is. 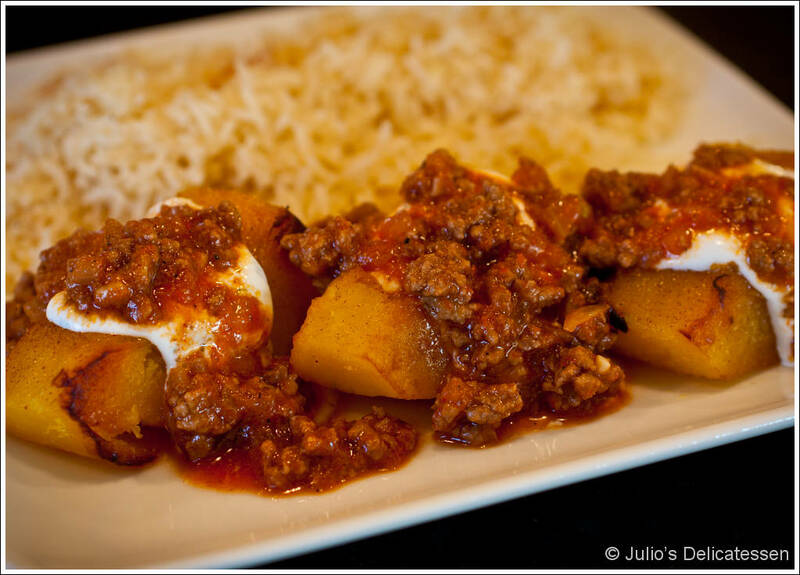 Kabul is one of our favorite restaurants in the bay area. (We now live on the central coast). Thank you so much for your adaptation. It was splendid.